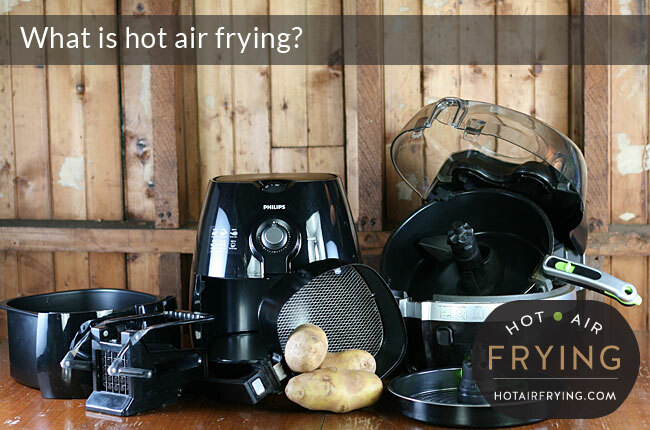 You are here: Home / What is Hot Air Frying? Would you like air fries with that? Hot air frying is a new cooking technique that allows you to fry, grill and roast without the use of copious amounts of fat or oil. You can get that deep-fried taste and texture without the grease. Hot air frying machines are the first real kitchen innovation since the 1970s, when we acquired slow cookers and microwaves. These appliances are designed to circulate extremely hot air in a fashion that mimics the movement and flow of heat currents in a pot of boiling oil, to crisp up the outsides of food while cooking it inside. Some designs also have a grilling element, for added browning and crispiness. Food ends up crispy on the outside, and very moist on the inside. Air-fried food will, obviously, taste a little different from deep-fried food, but most fans think air-fried actually tastes better: you don’t have the taste of the sodden-grease that later sinks to the pit of your stomach. But still, the taste is acceptably close to deep-fried without the terrible cleanup and the heavy oil smell in the house. It’s way less work, so you may end up eating fried food more than ever. On the face of it, it can look like the hot air machines take longer to make a batch of homemade fries than deep-fat would — say, 25 minutes for air frying versus 8 minutes for deep fried, but don’t forget to add in all the hidden warm up and cool down time before and after deep-frying, not to mention the hassle. As much as people might purport to love deep-fat frying, few people rarely do it at home anymore precisely for that reason. There’s the waiting time for the oil to heat up, then the waiting time for it to cool down, the cleanup, the filtering and storage of the oil — not to mention the odour. Hot air frying completely eliminates all that hassle. What’s truly unbelievable, but true nonetheless, is that most of us thought fried foods were basically banned from our lives forever — but with a hot air fryer, many of our favourite fried foods are back, and back as part of a very healthy way of daily eating! And for your cooking oils, you can now go crazy and experiment with some very interesting stuff: avocado oil, walnut oil, duck and goose fat, grapeseed oil, etc — the sky is the limit for healthy and tasty cooking fats now! These healthy, gourmet cooking fats are ideal for hot air frying! Hot air frying tremendously reduces the danger of making fried food. Young teenagers can be taught to operate hot air fryers as safely as they would toaster ovens and microwaves, and firemen’s lives would be a different place if people coming home from a night at the pub tossed a bag of frozen chips into the basket of a hot air fryer, and set the timer, instead of putting a pan on hot oil on the stove.